The first day of mobiles is really all about reaching the Mupamadzi and getting everyone settled along with a short afternoon walk. With this group it didn’t take long, so on day two we got straight into it. Leaving camp 1 first thing in the morning whilst the team packed up and shifted everything to camp 2 we had a lovely walk with lots of plains game, puku, Kudu, warthog, impala, bushbuck, waterbuck and a wonderful sighting of rarely seen reedbuck. Towards the end of the walk as we approached camp 2 we neared the river to take a look at some vultures drinking and bathing in the rapidly diminishing water when we were approached by three elephant bulls that did not know we were there. We moved into a position to let them walk past us but they got our scent and ran off, within the next 50m while negotiating a breeding herd of ellies feeding on acacia pods we bumped into three lionesses feeding on a puku. After a lot of growling and a 5 minute standoff we managed to pull out leaving them to their meal and managed to negotiate a way past the ellies without them knowing we were there arriving in camp with excited guests and a nice cold drink. 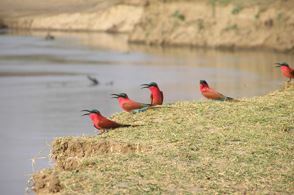 That afternoon watching carmine bee-eaters that have just arrived at their annual breeding colony in the banks of the Mupamadzi we spotted the same three lions resting in the shade of a reed bed in the river sand. They ignored us while we watched them from a short distance seemingly forgiving us for our earlier intrusion that morning on their meal time. We had a great sundowner on the edge of the river celebrating one of the guests’ birthday and a great day in the bush, with a bottle of champagne before heading back to camp. Day 3 saw a lovely morning walk watching elephants and zebras up on Lundu plains before heading down to a secret lagoon where we stopped for tea and sat watching an interesting interaction between baboons and Egyptian Geese with their goslings. Sadly though for one of the goslings it became lunch for a baboon. The afternoon walk was greatly helped by some pukus which were alarm calling and honing in their direction it wasn’t long before we found the 3 lionesses again this time having been joined by a young male. He was slightly nervous of our presence but soon calmed down and settled into a lazy snooze in the river bed. 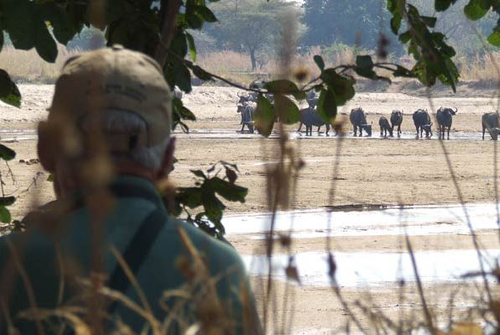 This wonderful sighting was quickly followed by a lovely herd of some 259 odd buffalo coming down and feeding on the banks of the river. Day 4 arrived and it was time to move camp and head towards camp 3 where the walk took us to a point at Chufungwe plains with spectacular view of the plains where we saw herds of elephant feeding and a loan figure of a majestic roan bull. That afternoon walk through the “gardens” west of camp 3 where we saw zebra, kudu and an inquisitive bull elephant that wanted to know who we were. Going through the gully towards sun downers we found a young male leopard sunning himself on the edge of a dry river bed in the late afternoon light, he obliged us with a few photo opportunities before he darted off into the reed beds of the Mupamadzi before reappearing 200m upstream in the long grass to study us as we walked on to our sundowners at second anthill. Day 5 and time to move to camp 4, on our way we sat at drying up waterhole while marabou storks feasted on the catfish that they were catching whilst the bushbuck, waterbuck came down to drink whilst the warthogs and a lone elephants bull came to enjoy a mud bath. That afternoon we got the guests to pack a small overnight bag, toothbrush and a change of clothes, and we walked out of camp 4 past the Mupamadzi 6 (6 magnificent size elephant bulls that like to hang around the back of camp 4) onto a herd of about 300 buffalo followed by a herd of 30 eland before reaching our sundowners spot and a small camp set up with shade net tents for a night under the stars. After sundowners and a campfire dinner we settled in and did some star gazing learning about the different constellations with the night sounds around us. We all settled into our bedrolls with the rumbling of an elephant not too far from camp. 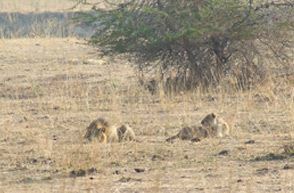 In the early hours of the morning the distant roar of lion that progressively got closer to camp woke me. By the time every one had risen for sunrise and early morning coffee and toast the roaring had stopped but needless to say it was certainly the topic of conversation at breakfast. What a start to our last full day of safari. We wasted no time in getting ready for the walk and headed in the direction of the calls. It took us some time to find fresh lion tracks that led us in a circle back towards camp but we lost them on some ground where warthog had been rooting for rhizomes. With the feeling of disappointment starting to set in the scout suddenly spotted some vultures coming in to land near to where we lost the tracks so we went to investigate. We found fresh blood of a kill but no tracks or drag marks, while we were scratching our heads some vultures sitting in a nearby tree started diving into a bush a 100m away and causing a large commotion. Bingo! We heard a lion growling as he pulled his meal away from the vultures and presumably us. We moved into a position where we were able to get a glimpse of him in a mopane thicket he then appear for a couple of seconds to voice his displeasure of having his meal interrupted enabling everyone in the walking party to get a good look at him before he disappeared back into the thicket to guard his meal from the ever-present vultures. We left him in peace and continued our walk with the plains game that roam the in the beautiful surrounds of the Mupamadzi valley. 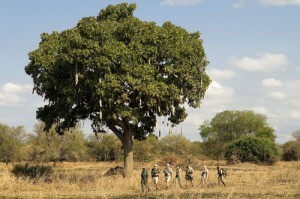 Photos – and copy, for that matter – courtesy of Robin Pope Safaris.